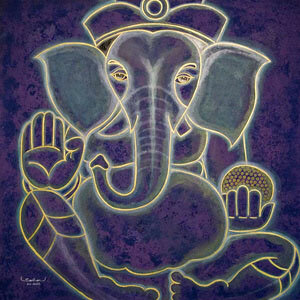 Deity Ganesha serves as the subject for this painting by Santhan Limpaiboon. 'Ganesha is usually revered as the remover of obstacles, patron of arts and sciences, and the deity of intellect and wisdom. As for me, it gives me strong feelings. 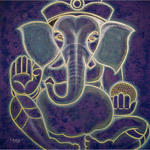 Every time I run into an image of Ganesha, I feel like a blessing that gives me a strong determination," says the artist. This painting was made by Santhan Limpaiboon. The artist was born in 1974 in Chiang Rai in northern Thailand. He now lives and paints in Chiang Mai. ... Read Santhan's full biography on Ezistock Blog.